Easycove® has found a way to save time during pre-formed cove installations – Join and Seal Adhesive. By placing a thin line of the Join and Seal Adhesive to the edge of the coving, and pressing together the cove base, you will create a completely monolithic cove that is properly aligned. This product is KEY to keeping the cove in perfect alignment from top to bottom. The Join and Seal is also used to “tack-up” areas of cove installation to hold the top of the cove to the wall, allowing time for the adhesive to set up. This feature product eliminates the need for taping or tack nailing and further ensures ease of installation. 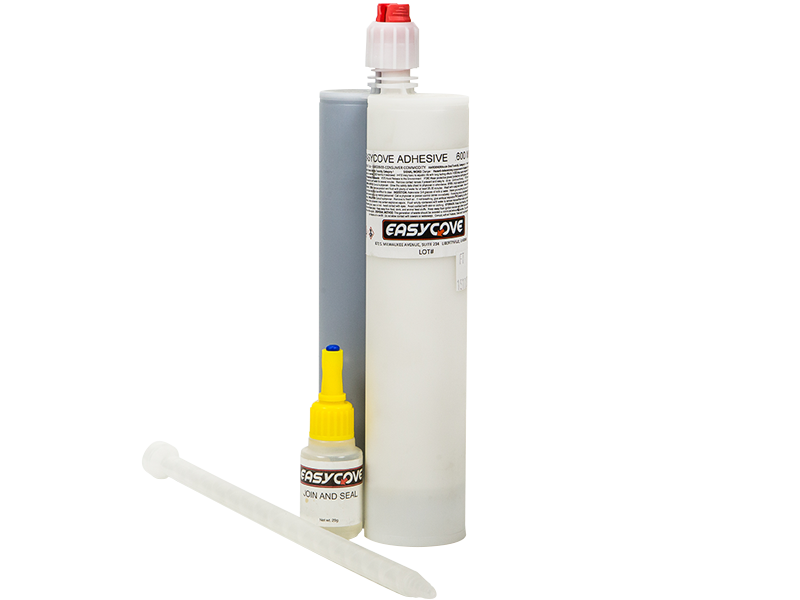 Easycove® Join and Seal Adhesive is a single component low viscosity cyanoacrylate adhesive. It is a fast setting wicking grade adhesive ideal for bonding preassembled parts. Bringing unique engineering to the coving marketplace.